Etna (Italy). INGV-CT reported a series of landslides on 19 June from the NW rim of the pit crater located on the lower E side of the Southeast Crater. The collapses generated small ash clouds that drifted NE, and changed the pit crater’s morphology. Data from a thermal camera showed thermal anomalies over 180 degrees Celsius indicating that the landslide material was hot. Fumarolic activity was seen in the landslide area during an inspection the day before. Gorely (Russia). KVERT reported that during 6 and 12-13 June strong steam-and-gas activity was noted, and during 11-18 June seismic activity was above background levels. A small increase in the size and temperature of a thermal anomaly over the volcano began on 15 June and was detected until 18 June. The Level of Concern Colour Code remained at Green. Ioto [Iwo Jima] (Japan). Based on a pilot observation, Tokyo VAAC reported that an ash plume drifted more than 35 km N.
Nevado del Huila (Colombia). INGEOMINAS reported that during 9-15 June sulphur dioxide plumes were detected by multiple sources. A distinct change in seismicity was noted on 13 June and was characterized by an increased intensity and a greater number of hybrid earthquakes. These earthquakes were shallow events beneath Pico Central. The Alert Level was raised to II (Orange: ‘probable eruption in term of days or weeks’). On 16 June two episodes of tremor possibly indicated ash emissions; this was unconfirmed. However, sulphur dioxide plumes were again detected. During 20-21 June small white pulsating fumarolic plumes drifted W.
Pacaya (Guatemala). INSIVUMEH reported that during 16-22 June MacKenney cone emitted white-and-blue fumarolic plumes that rose 50-400 m high. Ash emissions were occasionally observed. INSIVUMEH also noted that the lava flows on the SE flank were advancing more slowly and exhibited fewer areas of incandescence. Tiatia (Russia). SVERT reported that a thermal anomaly was detected by satellite on 19 June. Tungurahua (Ecuador). Steam-and-ash plumes were seen during 16-18 June that rose to altitudes of 5.5-7 km a.s.l. Daily reports of ashfall came from multiple areas about 8 km W and SW, but ash was noted as far away as 15 km SW on 17 June. Ashfall in Cahuají (8 km SW) covered pastureland, preventing animals from grazing. Roaring noises were occasionally reported. During 17-18 June incandescence from the crater was seen at night. An explosion was followed by roaring noises, sounds resembling blocks rolling down the flanks, and incandescence. On 19 June steam-and-ash plumes rose 500 m above the crater and large windows vibrated after noises were heard. The next day snow covered parts of the E and S flanks. Steam-and-gas plumes rose 500 m and drifted SSW, E, and NW during 20-21 June. Lahars in drainages to the SW carried blocks up to 50 cm in diameter. On 21 June ashfall was reported in areas 8 km W.
Ulawun (Papua New Guinea). RVO reported that during 16-17 June white and gray plumes rose 1 km. Fine ash fell on the SW, W and NW flanks. Low rumbling noises were heard from the S and SE flanks and weak fluctuating incandescence was observed for a brief period. On 18 and 19 June white-to-grey plumes rose from the crater and roaring noises were reported from the NW flank. Seismicity increased to a high level and was dominated by volcanic tremor. During 19-20 June continuing white and grey emissions produced plumes that rose 1 km. Fine ashfall was seen on the NW and SW flanks. Fluctuating incandescence was seen from the S and SE flanks and occasional low roaring noises were noted. Seismicity declined to moderate levels on 20 June. Batu Tara (Indonesia). Darwin VAAC reported that during 19-20 June ash plumes from Batu Tara rose to 3 km a.s.l. and drifted more than 35 km NW. Dukono (Indonesia). Darwin VAAC reported that during 18-20 June ash plumes rose to 2.4 km a.s.l. and drifted 120 km W.
Gaua (Vanuatu). Wellington VAAC reported that during 16-19 June ash plumes rose to 3 km a.s.l. On 19 June the plume drifted more than 90 km W.
Karymsky (Russia). KVERT reported that during 11-18 June seismic activity was above background levels. Seismic data suggested that possible ash plumes rose to an altitude of 5.2 km a.s.l. during 10-12 June and to an altitude of 3.9 km a.s.l. on 16 June. Satellite imagery analysis revealed ash plumes that drifted about 195 km E on 10 and 11 June and a thermal anomaly over the volcano on 11, 15 and 16 June. Small ash clouds drifted 22 km E on 17 June. The Aviation Colour Code level remained at Orange. Kilauea (Hawaii, USA). During 16-22 June HVO reported that activity continued from the summit and the east rift zone. At the summit the level of a lava-pool surface in the deep pit inset within the floor of Halema’uma’u crater remained mostly stable; glow from the vent was also visible at night. A plume from the vent mainly drifted SW, dropping small amounts of tephra and occasionally fresh spatter downwind. At the east rift zone lava flows that broke out of the TEB lava-tube system built up a number of rootless shields between 580 and 520 m elevation. Satellite images showed thermal anomalies from minor lava flows originating from the shields. The Pu’u ‘O’o web camera views of a lava pond on the crater floor, that was an estimated 300 x 150 m in dimension, were often obscured by fumes. One small lava flow was seen on the crater floor on 18 June. Scientists saw a new gas vent on the E wall of the crater during an overflight on 21 June that had generated incandescence during the previous few days. Kliuchevskoi (Russia). 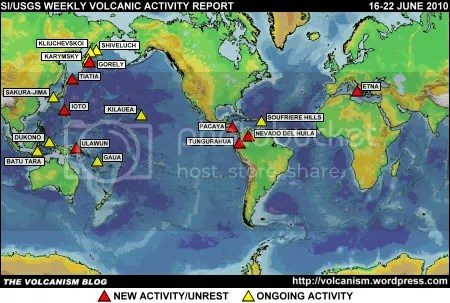 KVERT reported that during 11-18 June seismic activity was above background levels and Strombolian activity was observed. Ashfall was reported in Klyuchi, 30 km NNE on 11 June. Ash plumes occasionally rose to an altitude of 5.5 km a.s.l. during 13-16 June. Satellite imagery analysis revealed a large daily thermal anomaly from the volcano and ash plumes that drifted 40 km SE on 13 and 15 June. The Aviation Colour Code level remained at Orange. Sakura-jima (Japan). Tokyo VAAC reported that explosions during 16-22 June sometimes produced plumes which, along with ash plumes occasionally seen by pilots, rose to altitudes of 1.2-3 km a.s.l. Two eruptions on 20 June brought the total number of eruptions in 2010 to 550, setting a new annual record. The total number of eruptions in 2009, the previous high at Sakura-jima, was 548. Shiveluch (Russia). KVERT reported that during 11-18 June seismic activity was above background levels and suggested that possible ash plumes rose to an altitude of 4.9 km a.s.l. Strong fumarolic activity and hot avalanches were seen on most days. Satellite imagery showed a large daily thermal anomaly over the lava dome, and a small anomaly near the lava dome on 15 June. The Aviation Colour Code level remained at Orange. Soufrière Hills (Montserrat). MVO reported that pyroclastic flows from the lava dome occurred during 11-18 June. One of the largest pyroclastic flows traveled W down Gages Valley; others originated from within the collapse scar. A thermal camera showed several hot areas on the lava dome, likely exposed from rockfall and pyroclastic flow activity. On 28 June a small lahar descended the Belham Valley to the NW. The Hazard Level remained at 3. 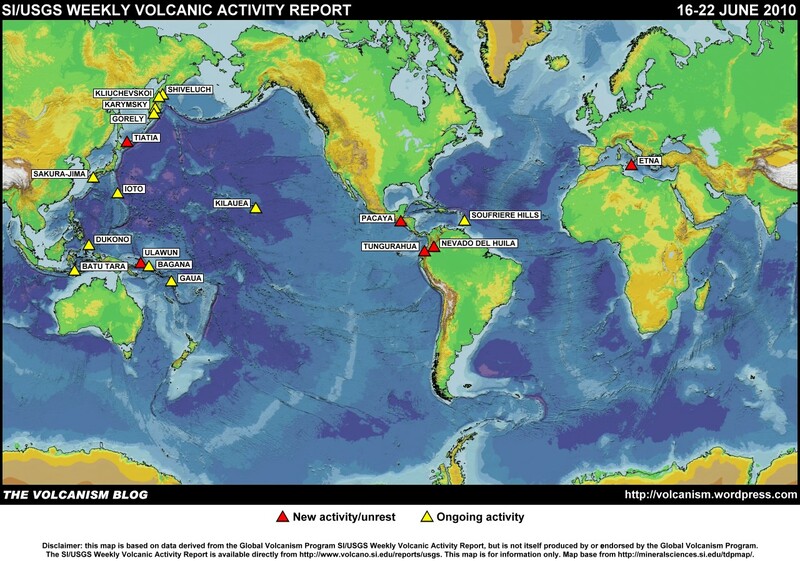 The foregoing is a summary of the Smithsonian Institution/United States Geological Survey Weekly Volcanic Activity Report covering 16-22 June 2010. It is provided for information only, and is based on but not a substitute for the full report, which comes with its own criteria and disclaimers. The map base is derived from the Smithsonian Institution/USGS/US Naval Research Laboratory This Dynamic Planet website.